Whether you’re a touring pro who spends months away from home or you’re teaching disc golf clinics in your home state, or if you’re Zoe Andyke you do both, it can be a challenge to keep your mind and body ready to perform at all times. In this installment of our DD Women’s Series, we’re going to be let in on the secrets for success when it comes to staying fit, eating right, and how to balance the pressure of it all. 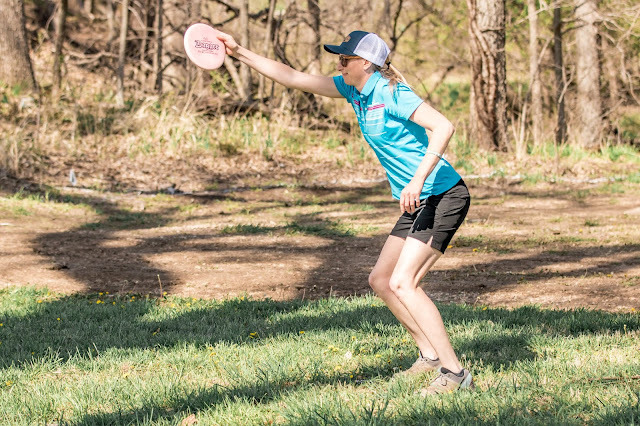 If there’s one thing we’ve learned so far from Zoe in our first two blog posts, it’s just how dedicated she is to growing disc golf. Her efforts to teach women and children across the nation no doubt take a toll from time to time, because after all, she’s only human. Let’s find out about Zoe’s perspective on maintaining your health. Does that mean you can make excuses left and right and put off your health for another day? No way! Andyke makes sure she eats right and engages in cardio five days a week regardless of her disc golf schedule. Anyone who has met Zoe can instantly see what a ray of sunshine she is. You’d be hard-pressed to see her in a bad mood and this positive energy carries over to her performance on the disc golf course. What’s her secret? The aspect of having a strong mental game is so commonly talked about that sometimes as players we forget to focus on all of the ways we can be positive, both on and off the course. This element is a huge part of who Zoe is, not only as a professional disc golfer but as a friend and teacher. Want to know more about how Andyke’s routines fit into the life of a touring pro? Check out our fourth and final part of this series to learn what Zoe eats, drinks, and how she sets herself up for success each tour season!